#Anaerobic digestion may be described as the equivalent of “composting without air”. Under normal conditions, such as in a compost bin, aerobic (oxygen breathing) organisms break down biodegradable organic materials into simpler forms of matter, producing carbon dioxide (CO2) in the process. But in anaerobic digestion, the biomass is decomposed with the exclusion of air. In the absence of oxygen, certain microorganisms break down the biomass to produce biogas which is in general 40% to 60% methane (CH4), a clean-burning renewable combustible gas. Is Anaerobic Digestion Truly Beneficial to the Environment? We all want what is best for the environment. Therefore, we will support any initiative where the variables have been considered and the waste is dealt with in a way which maximizes the recovered value while minimizing the environmental impact. We believe the combined energy recovery and recycling achievable through anaerobic digestion often make it the best recovery option for certain bio-wastes, such as agricultural manure and slurry and separately-collected food waste. There is also some uncertainty over the relative value of carbon, when used as a source of energy, compared with its long-term value in augmenting soil organic matter. Recent research has placed a high value of the fibrous output (digestate from the Anaerobic Digestion Process) as a soil organic matter for carbon storage. While all Anaerobic Digestion facilities should also make use of the waste heat in CHP schemes, and provided that they do. It is generally recognized that anaerobic digestion plants hold a strong record for environmental benefit. This is for renewable energy production, reduction in agricultural pollution, and raising the carbon content of the land when the fibrous digestate is used as a soil improver/ fertilizer. In the Temperate Parts of the Globe AD Plants Require Heating? In all but the hottest climates AD plants generally require heating to maintain their chosen operating temperature ranges. A typical looking agricultural anaerobic digestion plant. To have to heat large tanks of initially cold feedstock which for all the most common “Wet” biogas process designs, is a heavy burden on the net energy output of any Anaerobic Digestion Process plant. Generally, the choice of a temperature range for anaerobic digestion is strictly dependent on the bio-climatic conditions. In tropical countries, like Tunisia, where the ambient temperature is higher than 25 degC for a period of more than 8 months in a year, thermophilic anaerobic digestion is readily applied and may be self sustaining without heating. But, in much cooler Sweden, for example the heating demand is high. So, most plants are “mesophilic” in their operating temperature range, this being cooler than “thermophilic” temperature range digesters. Furthermore, research is currently underway for possible anaerobic digestion under low temperature conditions. In the USA, anaerobic digestion of sludge under thermophilic conditions has been found problematic in cold states. However, it is well established in Europe where highly efficient well heat-insulated modern Anaerobic Digestion plants are being built, especially for the treatment of the organic fraction of municipal solid waste (Ahring et al., 2002). What is Co-digestion Mean when Applied to Anaerobic Digestion Processed? Co-digestion simply means that more than one biomass source is used to feed the biogas plant. Co-digestion can raise the yield of biogas per unit of carbon source in the feedstock, because it usually helps to improve the C:N (Carbon to Nitrogen Ratio) of the feedstock. The secret of a healthy bio-reactor lies in a good C:N ratio. Green wastes/ materials have a high nitrogen ratio, whereas brown/ woody materials have a low C:N ratio. Co-digestion provides the opportunity for the green and brown(woody) wastes to be stockpiled and mixed in quantities that when fed into the bio-reactor provide a good C:N balance. In a report from WERF (2014a), co-digestion was analyzed with six substrates: canola oil, restaurant grease, ethanol silage, cheese whey, chicken manure and bio-diesel glycerin. The different feedstock have been tested and compared to the thickened sludge only case study: in all the scenarios presented, biogas production was increased with respect to the anaerobic digestion of sludge only. Better results are related to glycerin, grease and cheese whey, while chicken manure has a very reduced influence on the overall biogas production (because of the lower specific COD content respect to the other feedstocks). Glycerin and restaurant grease show, in the laboratory phase, an increase in biogas production from 35% (in the first 25 days) to 99% (in the second 25 days). Source separated organics (SSO) [food scraps and yard waste] were a few year ago thought to be best aerobically composted, but recent research has shown anaerobic digestion makes the best sense, especially in urban areas where land for aerobic composting is not available. Digested food waste is also high in nitrogen, so it makes a good companion when combined with say an agricultural dairy farm biogas plant which is also fed with farm manure. Nevertheless, the fibrous output (digestate) still needs to be aerobically composted after digestion to condition it. Food scraps and yard waste can be mixed with sewage sludge (“biosolids”), as long as the biosolids are from regulated sewage works such as in Europe, and where contaminant loadings do not preclude the land application of the digestate output. It would not make sense to mix toxic sewage sludge with yard waste (e.g. as unless the digestate can be placed on the land as fertilizer it’s disposal comes at a high cost. The yard waste from a dairy can be much cleaner, and shouldn’t be blended with more toxic sludges. Doing so also makes it ineligible for accreditation as a suitable fertilizer, as is also the case for compost under organic certification standards, which bars heavy-metal rich sewage sludge as fertilizer. As we have indicated earlier in this article, the methane output is actually one of several great benefits from the process. 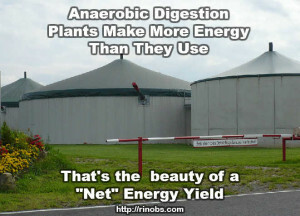 Anaerobic digestion also reduces waste and odor. The biogas yield is actually dependent on the rate of Cellulose solubilization. Cellulose solubilization is the rate determining step in the anaerobic digestion of organic solid waste. An increase in the rate of solubilization should lead to an increase in the overall efficiency of the anaerobic digestion process. Processes are being developed to raise the rate of cell-rupture in “hard-to-digest” feedstocks, and the most readily abundant of such sources is sewage sludge. physical methods to create lysis, such as Utrasound, and “exploding” (i.e. repeated rapid pressure changes). Reactor studies on cellulose solubilization rates are typically conducted in anaerobic, mesophilic environments with approximately neutral pH and may be inoculated from a range of source environments including landfill leachate, manure, sewage sludge, anaerobic digesters, or the rumen. 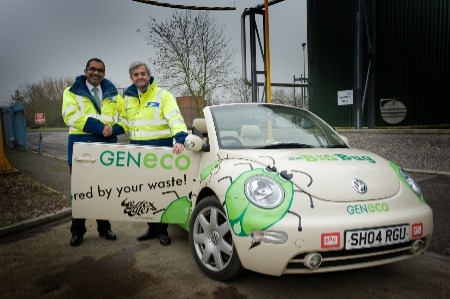 Are All Anaerobic Digestion Process and Biogas Plants Home to the Same Micro-organisms? Despite similarities in the operating conditions of reactors inoculated from different source environments, the respective microbial communities may differ in many respects, including their species profile, biofilm architecture, nutritional requirements, particle colonization, and hydrolysis rates. Microbial communities in cellulolytic environments are highly complex with interactions among numerous trophic groups required to carry out the digestion process. It is possible to view Anaerobic digestion as the equivalent of “composting without air”. Anaerobic digestion isn’t simply “greenwash” it does provide substantial green benefits, and the waste heat should be used in CHP systems, in all biogas projects. Biogas production for co-digestion is greater than for separate digestion of the same materials. #Anaerobic digestion is a great process for creating renewable energy, and it is also unique in that it solves many other problems, especially if the feedstock material which is used as the substrate to “fuel” the anaerobic digestion is a waste material, and not a food crop. So, to avoid this article becoming excessively long I am limiting this article to a discussion of #anaerobic digestion pros and cons, for anaerobic digestion (AD) plants where the feedstock is 100% waste material and to commercial anaerobic digestion plants built in the industrialized nations. AD plants, which are more often called “#biogas plants” in the industrializing nations, have a slightly different list of advantages and disadvantages. That’s because by their nature they are much smaller, and usually built for different reasons from biogas in Europe, or the US, for example. 1. Produce renewable energy with the smallest possible impact in terms of carbon dioxide emissions. 2. Can be used to process diseased and infected organic matter, and as long as a suitably high temperature is attained during the process, a safe pasteurized output is produced which will not spread disease. 3. When waste feedstock materials like food waste are digested,which would otherwise have been sent to a landfill, the volume of waste which goes to landfill is reduced. 4. Diversion of organic waste away from landfill, will also have the effect of reducing the amount of organic “rottable” (putrescible) matter in landfills, making them less likely to cause pollution in the future. 5. The output, known as digestate, can be used as a crop fertilizer which also has the ability to make many plants more disease resistant. When used in arid climates it can improve the water retaining ability of the soil, and reduce irrigation requirements. 6. The liquid digestate is a better fertilizer in many ways than normal chemical fertilizers. 7. The fibrous digestate the fibrous digestate has many uses. If it is not spread immediately on fields it may be used in some circumstances as a leading for livestock. 8. The digestate produces less odour when it is spread on farmland, and is less likely cause pollution of local rivers and streams and spreading untreated manure. 9. When the biogas is used on-site to generate electricity there is spare heat in the form of the engine cooling water, which can be used on the site it is created (e.g. on the farm for heating, or to heat the factory where the biogas plant is installed, or a near neighbour. That is known as CHP (Combined Heat and Power). 10. Certain businesses that pay a carbon levy for their carbon dioxide emissions can offset their levy costs against the carbon savings from running their own biogas plant. 1. Commercial anaerobic digestion plants are costly to build and usually need bank loans to finance them. 2. The plants need expert people to design, construct build, and operate them. They must be attended pretty much every day, to ensure they run correctly, and are more complex than say installing a solar cell. 3. To be successful each anaerobic digestion plant must have a reliable source, and usually a number of different reliable sources, of feedstock materials. That can be diffilcult to obtain. 4. Suitable sites can be difficult to find as the public may object to planning applications for AD plants. These are the main advantages and disadvantages of anaerobic digestion. 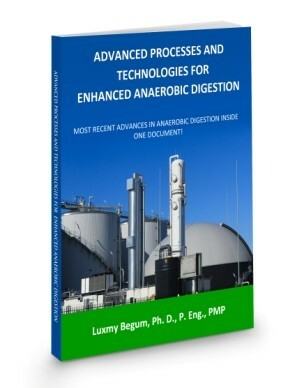 We hope that this article has helped you understand that there are many more advantages to using the anaerobic digestion process than disadvantages. The growth of #anaerobic digestion in the UK has not met Defra’s strategy target of 2011, when 1,000 new digesters were to be built by 2015. In fact less than half that figure was achieved, nevertheless the industry has been growing rapidly in real terms in the UK. Considering, the difficult economic circumstances, and reticence until quite recently on behalf of potential investors, the number of plants which have been brought on-stream is remarkable. In the area of Waste Management, the the charity of plants will be needed to process food waste and in particular food waste collected from households. One benefit of slower adoption of anaerobic digestion technology, has been the additional time that has enabled #biogas plant process technology to be developed. While such processes were undoubtedly successful for certain quite closely site-specific organic wastes, they were over-sold, and after a rapid initial take-up were then found unable to live up to expectations, and were soon abandoned. Inevitably, this left many clients with heavy costs replacing failing equipment. A number of commentators have suggested that these experiences left a legacy of distrust in the AD process as a whole which has persisted until quite recently. In the UK this may have led, at least in part, to what was almost a complete absence of industrial anaerobic digestion plants, in the last decade of the century. When anaerobic digestion plants did start to emerge it was the simplest of single reactor (mesophilic) type of AD plants, which lone UK advocates of anaerobic digestion had continued to espouse. The most successful of these was the plants produced by Michael Chesshire, and his company Farmgas. He was able to show that those processes used in his on-farm biogas plant systems were capable of reliable long-term profitability when the UK DoE (now Defra) chose to award his successor company to Farmgas, named Biogen the funds to demonstrate it on a feed stock of food waste. At the same time, during the latter part of the 2010s, work by Southampton University researchers showed that problems reported with food waste only biogas plant operation after more than a year from commissioning were avoidable. Process problems would in future simply be avoided by adding certain depleted (and essential) rare earth’s to the feed materials. Paradoxically, due to the fact that large quantities of water are added to the standard AD process, this method of waste “treatment” results in a much larger volume of material after the process than before it. It is only made viable to pay what it costs to dispose of the resulting “digestate” volumes, by the high value of the energy produced. Dry type ananerobic digestion systems which produce less liquid digestate, are being built but don’t achieve as high a biogas yield as the stadard “wet” process. So, while selling the gas remains as the main income, uptake will be likely to remain muted. The future for the next 5 years of anaerobic digestion industry development will be increasing numbers of biogas plants using essentially the existing core process plant design, in which the vast majority of plants will be single tank mesophilic reactors. It is expected that in accordance with EU requirements, which are likely to be passed requiring all councils to collect and digest household food waste, and government zero-waste pledges, the main demand within the waste management sector will be for food waste digesters. 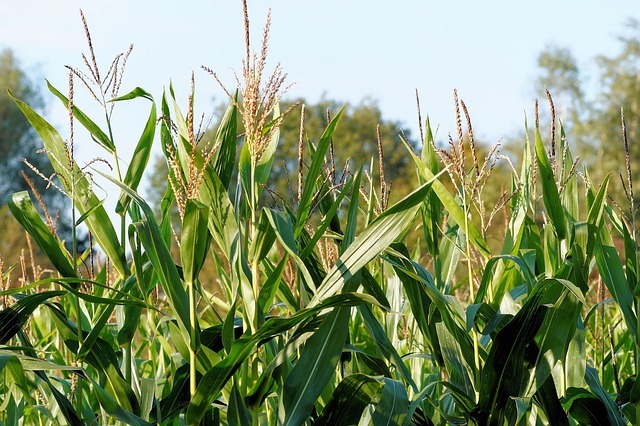 On-farm or what are also known as farm-scale #anaerobic digestion plants are most often built to provide an income from the #biogas that is made from manure. The manure which is treated may be from stock litter waste created when stock is kept under cover, plus farm slurries and farmyard run off. There may be other sources of organic feedstock added to these plants, as the most cases they are primarily intended to take manure. Due to economic constraints, and the need to avoid time spent running these units and maintaining them, these anaerobic digestion systems are invariably the simplest of designs and built to the lowest budget’s possible. In fact, in many cases these plants are, what is known as a “distress purchase”, because the main motivation towards the installation, may be a need to reduce farm run-off pollution from the working areas of farm buildings, and also in highly nitrate sensitive watercourse areas, pollution of nearby watercourses. Another reason for installing these plants can also be for odour reduction. Many of these plants are appearing in the landscape, throughout much of Europe and the U.S. They are single stage, continuously stirred tank reactors (CSTRs). In other words they comprise of essentially just one large mixed digester vessel. The mixture of the feedstock, which is made into a slurry by cominution and the addition of recirculated digestate, or in the case of existing slurry just a slurry itself, is pumped into the large reactor tank. The mixed liquid, which is known as the substrate in these plants has a solids concentration of approximately 4% to 5%, and the temperature is normally 35 C. It is known as mesophilic digestion. The financial viability of these plants is often finely balanced. That being the case, that being the case there have been a number of cases where budgets have been paired and the resulting newly installed biogas installations have been almost too cheap for viable operation. Cheap tank construction, and rushed installation, with the aim of keeping costs down, and minimizing construction periods so that plant owner can commission the facility rapidly and begin to get pay back very quickly, can play so much pressure on installation contractors, are too many corners are cut. Such plants, seldom meet expectations, and the design life of them can by experience, the remarkably short. It is unfortunate, that in current times, when there are many anaerobic digestion EPC contractors vying for work, that each is being forced to compete on price. That means that we can expect a surprisingly large rate of plant failures in the next few years, for the owners of budget on-farm biogas digesters. 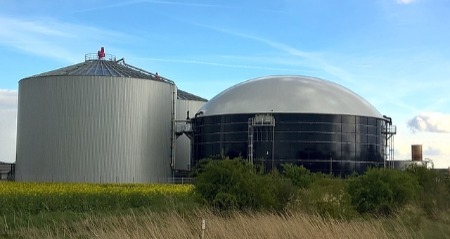 Many biogas plants of this type currently being put forward in bids by the owners of on-farm biogas plants, to accept additional household food waste. While this may be a salvation for the farming business, as accepting say to up to 10 per cent of its throughput as food waste, will greatly increase the biogas yield, low cost budget biogas plants seldom possess sufficiently sophisticated pipework and pumping equipment, for this use. The result, seen in many such food waste co-generation contracts, has been that adding the food waste has resulted in plant blockages, lost biogas production due to excessive downtime, and unhappy council waste disposal departments. The owners of on-farm biogas digesters need to take professional advice from expert biogas plant designers before they bid, and include in their prices for upgrading their biogas plant systems, before they start to add food waste. Them we all should applaud farming businesses that are taking on board a real financial risk in installing farm biogas plants. Not only are they are improving the environment of their farms for the good of the general public, but they are providing much needed renewable energy, without which governments would be unable to reduce the rate of global warming caused by greenhouse gases emitted by fossil fuel consumption. The net energy yield of #anaerobic digestion plants, which is the sale-able energy left after all the sacrificial energy demands of running an #anaerobic digestion plant are taken into account, is a subject of huge concern for all AD plant operators. Not only is the sale of the net energy the main income for most such #biogas plants, but a plant’s claim to legitimacy as a low-carbon energy producer is also at stake. Strictly, also the plant operator should be able to quantify the energy used in the construction and maintenance of his plant and carbon dioxide emissions caused, as that will have a bearing on not only lifetime biogas plant costs, but also be part of the whole-life plant energy (and carbon footprint) balance. Ultimately, it is this essential to understand how environmentally sustainable any anaerobic digestion plant truly is. The net energy yield from anaerobic digestion is calculated from the methane output achieved under operational conditions, less the energy losses incurred during feedstock transport and handling, before the digestion process starts. In addition, digester heating and mixing, and the energy costs of digestate handling and disposal need to be factored-in. Anaerobic digestion typically yields methane in quantities ranging from 0.2 Nm3 methane/ kg VSrem for low calorific value feedstocks, for example farmyard manures/ slurries, to more than 0.5Nm3 methane/kg VSrem for high strength feedstocks (e.g. food waste). The key to optimising this yield is to optimise the volatile solids VS removal. In other words, to make sure that as much as possible of the organic content within the feed material is digested, and does not simply avoid being further decomposed in its passage through the process, and flow out in the digestate. Achieving optimisation requires that close attention is paid to operation and maintenance 24/7, and a healthy micro-organism population in the digester. The internal costs of feedstock processing and digestion typically account for 15 to 20 percent of the energy yield. This cost is relatively consistent and unchanging for the life of any particular plant, as long as the feedstock type and digestate disposal routes remain unchanged. The same cannot be said for the energy used for all activities in feedstock delivery and digest recycling, because this is solely dependent on the transportation distances travelled. To illustrate this point, consider the degree of change should the source of the feedstock alters, or a digestate disposal route ceases to exist. In such circumstances, the net available energy may fall-off to unsustainable levels. To avoid this biogas plant operators must see it as of the highest priority to negotiate secure sources of feedstock, and fall-back recycling routes for the digestate. Without this, anaerobic digestion plant owners/ operators might find themselves, at some future date, unable to prevent their biogas project descending into an energy deficit. It is clear that an energy deficit at a biogas plant, if it was to occur, would render the project concerned unsustainable, and that coupled with a likely loss of business goodwill, is a result which it is all-important to guard against. This in implies that biogas plant operators, who wish to safeguard their investment, must sign-up the producers of the organic waste they use as their feed material in-advance. The need is for long-term contracts, set up with terms compiled from professional advice, for stated quantities and costs of feedstock set-in advance, and the with the assured availability of farmland suitable for recycling the digestate. Centralised anaerobic digestion plants, are a great idea, because they allow the pooling of resources to achieve multiple aims. These include not just for the #biogas plant operator to make a profit from a successful energy (biogas production) business, but also to sanitise waste for the health of a community, but also reduce water pollution, control odours, and more. The concept originated in Denmark, where they possibly still have highest number of plants. This type of biogas plant is referred to a CAD plant. CAD plants characterised for design purposes as very flexible plants capable of processing a wide variety of feed stocks. However, they are invariably at their core a manure treatment plant based design, and agricultural. In the most common application of CAD, several farms co-operate to treat their phone animal wastes in the single facility. It is not uncommon for local industrial and municipal wastes, also to be accepted and as a rule of thumb these may be taken as feed materials providing no more than 10 per cent of the total input material. This 10 percent can be viewed as an additional revenue because a gate fee will be charged. As long as the imported materials remain below 10%, any contamination will be unlikely to affect significantly the quality of the output as digestate, in reality. However, unfortunately this commonsense approach to allowing the output to be used as fertilizer by the farms within a co-operative, may be impeded by difficult to comprehend and apparently unnecessary rules applicable in many European countries at the current time. Notwithstanding this difficulty, which will hopefully be resolved in the not too distant future, by a reclassification of many so-called waste materials. Given, that as we said earlier, CAD plants are at their core based around agricultural waste treatment, it is not surprising that characteristically they are almost all based upon tried and tested manure digestion technology. By this, it means that they are low solids, mesophilic temperature range, type plants. They are designed around the water contents of a typical slurry from farms. This technology also happens to be very similar to the sewage sludge treatment biogas plant design. These designs are some of the earliest and most thoroughly proven which are available within the AD industry. Many contractors offer these types of plants, so this market is highly competitive and good value should be achievable from the best contractors who are active in supplying this type of biogas plant. Four CAD plants to be run successfully, really proactive management is necessary to ensure that the right next of different feedstocks are continually being delivered to the plant, not only by the other members of the co-operative, but also by those organisations also contributing organic MSW, and industrial or commercial organic waste. Providing that this balancing act, is achievable given seasonal fluctuations, the nature of holidays in tourist areas, and the need for continuation of feedstock supply in times when there may be growing competition for feedstocks, this is a good business plan. The biogas generation rates from CAD facilities in reality varies as much as the feedstock does. Estimates are hard to come by, but the publication titled; “Biological techniques in solid Waste management and land remediation”, published by the Chartered Institution of Wastes Management, 2009, CIWM Business Services Limited, Northampton, UK, WWW.CIWM.CO.UK, suggests typical rates. Using data from Denmark an average generation rate of 37 m3/m3 has been calculated. That sounds quite definitive, but in reality spread of biogas yields is large and varies from 23 to 90 cubic metres of biogas per cubic metre of feedstock. If these plants are operating on manure alone it is suggested that the yield in biogas would be something like 20 cubic metres of biogas cubic metre of feedstock. From that it can be assumed that the highest yields will be those from the CAD plants which are excepting highly calorific feedstocks in the form of the wastes such as household food waste. In the examples used here, and based on experience from Denmark, the viability of these #anaerobic digestion plants is heavily dependent upon them using their own farm and as the output destination for their digestate. These plants would not generally be economically viable if they were not able to use their own co-operative’s digestate and fertiliser, and instead had the cost of digestate treatment to finance. Of course, this should not be allowed to detract from the fact that they produce biogas which is every bit as good as that produced by other types of processes other than anaerobic digestion plants. It can be used for heating the farms, schools and other facilities in the locality. It can raise steam for food processing/ bottling plants, generate electricity for off-grid locations, and provide vehicle fuel for farm vehicles and local transport. Very few people would not agree that there is a bright future for #centralised anaerobic digestion plants and energy costs rise, as they surely will. 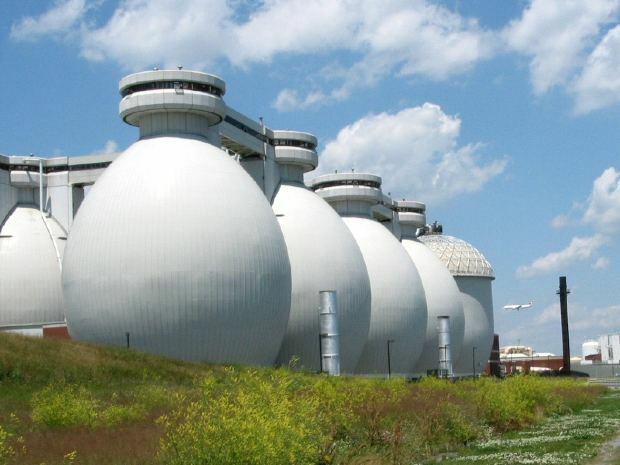 Biogas is the gas produced by the #anaerobic digestion of organic materials. It takes place in what is known as a #biogas digester. These are becoming increasingly common sights in the countryside. They are easily recognized once you have seen one or two. The main fermentation tanks where the anaerobic digestion takes place is usually circular in plan, green in colour (to make them inconspicuous), and at least 5 to 6 metres high around the perimeter. In diameter they may be from 15 metres to 35 metres, and over the top of them is placed a circular plastic membrane in which the biogas collects. Chemically, biogas comprises a mixture of methane at 55-65%, and carbon dioxide at 35-45%, the remainder being small quantities of other gases including hydrogen sulphide (H2S) and ammonia (NH4). The biogas contains water vapour at saturation point as well. Most biogas plant tanks and pipework systems are made of steel. Steel is easily corroded by H2S in water, as this is a strong acid even a small quantity of H2S can cause bad corrosion. 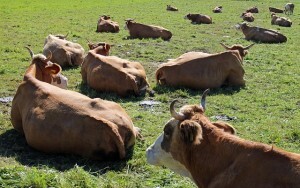 The secret of successful biogas production without costly downtime, is avoiding corrosion. Achieving this is dependent upon the operator keeping the hydrogen sulphide present, as low as possible to prevent corrosion. Many biogas plant design and build contractors have their own methods for minimizing this corrosion, and sponge filters made of iron, and carefully controlled air-injection, are just two of the methods used. One or two biogas plant contractors avoid concerns about corrosion by using non-corrodable stainless steel as the material of construction. This can be a wise move, but does cost more money during construction of the biogas plant. There is a straightforward use for the biogas. It can be burnt. It has a high calorific (heat) value, it burns cleanly, and is just the same as many other gases. At its simplest, all that is needed is a simple stove gas-burning ring. If there is a factory or any other user of heat, they may just burn the gas to heat a workspace. However, it is best when considering the efficient use of the energy at this level, to use it to run a gas engine which will convert the energy into electricity, and also heat. That heat, is nothing other than the heat which is taken out from the cooling jacket of the engine to keep it cool. It is normally hot enough to run through pipework and to supply radiators to heat the space in homes and factories. When this is done it is known as combined heat and power (CHP). As the cost of energy rises and society seeks to reduce the harmful emission of carbon into the earth’s atmosphere, more and more CHP installations at biogas plants are being built. However, the cost of by piping this heat, with all the insulation needed, is high. To keep construction costs viably low, the users of the heat provided in CHP schemes need to be close to be anaerobic digestion plant. An example of a very good CHP scheme can be when a landfill is constructed in the void left by the extraction of clay for brick production. If brick production continues at the site, the electricity, and the waste heat (CHP) can be used to heat up the bricks and save a lot of fossil fuel consumption, while also reducing the cost of brick production. Of course, if the biogas is used to generate electricity and there is no user for electricity nearby, it will be necessary to connect it to the local electricity grid. At some locations this connection may not be possible within a reasonable distance, and/ or the costs charged by the electricity company may not be affordable. When that happens the biogas can be used as vehicle fuel. This can be done at several different levels. At its cheapest, the biogas may just be given a minimum of clean-up and used in cars and plant operated by the biogas plant owner. In such a case it may make economic sense to keep the clean-up to a minimum and accepts that using it will simply be at the cost of additional corrosion maintenance in those engines. After-all, the energy will be very cheap and usually taxed at a very low rate. At the next level of sophistication, the most sophisticated proprietary biogas upgrading equipment may be installed to produce a refined (upgraded) biogas which is to all intents and purposes, equivalent to compressed natural gas (CNG). However, at this intermediate level of upgrading quality the CNG would not pass the rigorous tests applied for its commercial and retail sale as, CNG quality gas. Nevertheless, the use of this gas may be entirely intended for the biogas plants owner’s sole use, to fuel his local fleet. In such cases, there is no need for formal certification of this gas quality. Such biogas upgrading projects are becoming very popular, and indeed these are the sorts of installations which supply the biogas to many of the much publicized “green” buses and “green” trucks seen on our highways nowadays. The highest level of biogas upgrading, which requires not only the highest quality upgrading, but also additional monitoring and certifying of the biogas quality, is the production of grid quality compressed natural gas (CNG). This gas is so pure and guaranteed to be consistently pure, that it is to all intents and purposes the same as natural gas when it is taken that out of gas wells. This gas is very valuable, commands the highest price, and as long as there is a high pressure gas-main nearby, can be injected into the local natural gas supply. The proponents of sustainable living, point out that this use of biogas is the most sustainable and highly efficient way to use renewable biogas. That is because when electricity is generated there is a large power-loss in the cables and overhead lines, amounting to about 30 per cent in many cases before it reaches houses and factories where it is used. This is unavoidable and is inherent in all electricity generation and distribution systems. 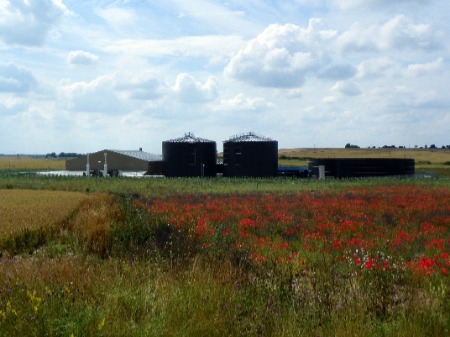 The choice of the best biogas use is made for each site by considering first of all the other there is a local user for the energy (for example in a factory), second what it would cost to connect the biogas plant to the electricity network, and thirdly whether there is an opportunity to connect to a pressure gas pipeline. If none of those are suitable, it is always possible to simply use the biogas to power transport vehicles. Finally, no article about what biogas is, and how it is used, is complete without pointing out that biogas (methane) is an explosive gas and at all times during process design, commissioning, operation and maintenance, great care must be taken to avoid accidents. All biogas plants, must be fitted with appropriate safety equipment. In Europe it is a matter of complying with a number of statutory regulations and guidance documents. The main regulations stem from the ATEX regulations and are based in each EU country upon the EU ATEX directives. Typical equipment includes gas-flares to burn-off gas during emergencies, flame arrestors, automatic emergency cut off valves, carbon monoxide detectors, and special AREX certified electrical and electronic equipment designed so that it does not create any sparks or have any hot components. In addition to all the necessary equipment needed to provide for safe operation of these plants when explosive gas is present, the operator of every biogas plant will also need to take care of the human factor. During certain maintenance activities, and in certain areas of the biogas plant, staff must always take precautions that their actions do not create the risk of an explosion. Clearly, such actions of smoking are outlawed, but also actions which may cause a spark, such as casual use of a hammer causing a spark, must be guarded against. For this reason there are guidelines and good practise manuals that must be used at all times when present in the vicinity of biogas plant equipment. Explosions are rare, but unfortunately the consequences are very serious when one does occur. That means that all biogas plant operative staff must be trained to work safely, and extreme caution is essential wherever working upon biogas plant maintenance. #Anaerobic Digestion of the sludge which is generated in huge quantities during the treatment of sewage is now the for treating and disposing of wastewater treatment sludge. This is a major change which has occurred over the last 15 years. Prior to that, when the energy costs were low, was incineration. However, incineration is now recognized as being not only too expensive, due to current high costs of energy, but also to damaging, due to the very high carbon dioxide emissions incineration incurs. Looking back in time, when modern sewage treatment began in the UK, the major cities all loaded their #sewage sludge into barges or specially equipped seagoing vessels and simply dumped the sludge out at sea. That was the lowest cost option and still would be if international marine treaties had not banned the marine discharge of sewage sludge. The the next step in sewage sludge disposal, adopted by the majority of the sewage undertakers was to spread the on land, as a fertilizer. However, due to the presence of heavy metals in domestic sewage which remained within the sludge, and tended to stay in the soil and build-up toward levels that would eventually mean that crops grown with themselves contain these metals at concentrations that would make them dangerous to eat. Although, the spreading of sewage sludge on land is still practiced in rural areas, where metals content in sewage is anyway much lower than in industrial areas, it soon became apparent that an alternative was necessary. That alternative was incineration, but as anyone who thinks deeply about this will realize, incineration makes very little sense when the alternative of anaerobic digestion is considered. To put it simply, in AD process takes sewage sludge (a form energy), and releases that energy for productive use, whereas incineration takes this form of energy and burns yet more energy, just to destroy it and send it up a chimney where it becomes just one more carbon emission increasing climate change even more. In comparison with other locations of the AD process, digestion and of sewage sludge is greatly simplified due to the fact that sludge is produced by the same organisation and by a known treatment process (i.e. the main sewage works treatment facility). That means that it is much easier to control the quality of the feed sludge, and is the case for a general AD plant taking waste under contract from a variety of sources. However, what does make sewage sludge digestion more difficult, is the fact that more directly reactive organic matter will have been removed during the anaerobic sewage treatment stage, through which the sludge settles out. Unlike anaerobic digestion the organic fraction of municipal solid waste, and wastes like household food waste, which release in their organic content comparatively easily, sewage sludge needs pre-treatment before it can be successfully digested for a good gas yield per cubic metre. For that reason, all sewage sludge AD plants have an added stage before the sludge enters the digester tank. The purpose of that stage is to break down the particles so that they release their energy. The most popular pre-treatment stage is known as hydrolysis. Hydrolysis simply means heating for sludge to a temperature above normal boiling point, under high pressure, and maintaining that temperature and pressure for a set period of time. There are alternatives to using hydrolysis to do this, microwave ultrasound has been used, and the addition of chemicals can have the same result. However, there is a #biogas plant is already producing its own heat and power and seems to be little reason for not using some of that heat and power in the hydrolysis process. In fact the hydrolysis process, we will implemented, should release much more energy from the sludge than the sacrificial energy required to run it. This must not forget that the primary reason for carrying out anaerobic digestion on sewage sludge is also to treat the sludge so that it can be disposed of in a sanitary and loan pollution manner. Thankfully, the digestate from sewage sludge anaerobic digestion plants meets that requirement very well. There is still of course a need to ensure that heavy metals are not discharge to land when the digestate is used as a soil improver and a fertilizer. Better control of industrial discharges has greatly reduced the metals content of sewage sludge, and in all but the most heavily industrialized areas of problem may no longer exist. However, much of the metal content may be found in the fibrous digestate and if so, after a period of composting in the open air coupled with dry, this material may be incinerated or incorporated into such products has building insulation board, or other non food related uses. 1. 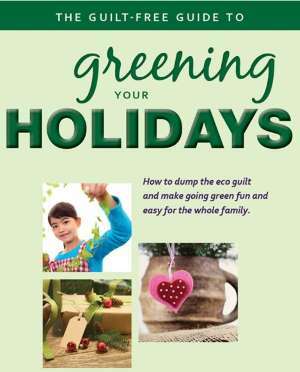 Source segregated household biodegradable waste that is, the food wastes from kitchens and green waste from domestic gardens. 2. The organic fraction of mixed Municipal Solid Waste (MSW). First the Biowaste is comminuted (crushed and chopped up). This reduces the size of each particle and increases the surface area overall for optimum digestion. If there are contaminants present, these are dealt with. Metals, plastics and glass are removed at this point by systems which may be manual (e.g. conveyor picking), or automatic. The incoming waste material is mixed with previously digested material, and liquids, to inoculate the new material with digester microorganisms. This is a vital stage and mixing must be thorough for optimum performance. The mixture now contains sufficient water to be pumped. If necessary additional fresh water may be added at this stage. This mixture is delivered into the digestion vessel, known as the digester or reactor. In many cases, there may be too digesters. Within the digester the organisms undergo fermentation in which degradation of complex molecules takes place and #biogas production occurs. During the digestion, these decomposition that takes place creates water from the more complex molecules, so the resulting digestate will have a higher proportion of water in it and did originally. Although, biogas, which is mostly methane is given of, the water escapes during the digestion stage. Digestate will then be discharged, usually as a constant flow, and dewatered. In many plants, this may entail simply discharging the digestate onto a concrete slab, and allowing the liquid content to run away a drain. Periodically, the solid digestate will accumulate and be removed from the slab either into storage, and subsequent windrow composting carried out (preferred), or into a trailer for spreading directly onto land (not preferred). Alternatively dewatering may be achieved by using a screw press. In some systems it may be passed through a centrifuge as well. The digestate liquid contains nutrients and organic matter and may possibly be used as a fertiliser, however, the liquor from all but agricultural waste is usually still classed as a waste material, meaning that it cannot be spread on land as a fertiliser. In such cases, it will be disposed of to sewer after further aerobic treatment to reduce the presence of ammonia, BOD and COD etc. This is very expensive, and is a cost which is frequently underestimated by biogas plant designers. 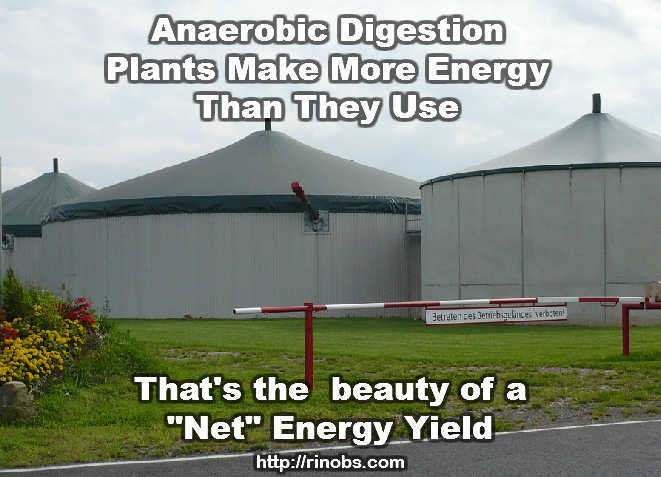 The big gain from the #anaerobic digestion system is of course the production of energy from biogas. Energy can be readily seen to be a premium product. Everyone needs an uses energy. It’s one of the best products you could ever wish to market in today’s society! You can burn it make heat, burn it to make heat and electricity, or you can upgrade it. In this context upgrading means that by the removal of the carbon dioxide in it and other impurities, to achieve a standard of purity that allows it to be compressed and as it is then in all respects identical to standard compressed natural gas (CNG), it can be injected into natural gas pipelines. Although this description approximates to what will be found in all biowaste #anaerobic digestion systems, each contractor holds their own special and often patented design and will introduce their own variations on the above. In anaerobic digestion of Biowaste you will see probably the biggest of all variations in the systems used. There are probably now several hundred biogas companies and each has their own variant on standard anaerobic digestion system designs having built their own systems. In such a young industry as this there is a lot of parallel development going on. It can be compared with the situation in the motor industry up to the 1960s. In those days cars had to clutch control, brakes and accelerator leavers in a variety of positions. Each manufacturer has its own idea about the best way to do things. No one system have been proven to be the best, but over many years and many models the industry arrived at the point is today, where anyone can jump into a car from one manufacturer to another, and expect to find brakes, clutch and accelerator in the same position. This is the situation right now in the anaerobic digestion industry worldwide, but just as the motor industry matured into a general acceptance of the one best way to do things, similarly the AD industry will evolve. It is to be hoped that there will be other close parallels with the motor industry. Just imagine how much more efficient and easier to maintain, control and use the motor cars of today are, in comparison with the first horseless carriages. Anaerobic digestion systems are so new that they are in any horseless carriage stage right now. Never say that anaerobic digestion won’t be the answer to society’s need for energy and raw materials for industrial chemical production. If you do, you’ll be in danger of making the mistake that people made at in the first days of the motor car, by in some countries a man walked ahead waving a flag. Many people said that the motor car was a gimmick and a fad, in those days. Would any person say that now? Always, remember this comparison, before you say that anaerobic digestion won’t work! Just how much output of #biogas and energy from biogas can be achieved, is an often asked and crucially important question, when planning a biogas project. Most feasibility studies conducted for biogas plants are based upon an assumption that the cost of disposal of the resulting digestate will be neutral. That being the case there will be only two sources of income. The first will be the gate fee and that will be assessed by researching for each project by talking to council waste disposal officers, and business managers within those companies who have organic waste they wish to dispose of locally. The second and the only one that we can discuss in general terms here, is the output of biogas, and how much revenue that can produce is therefore essential question. In many cases, it will be the only income source of that his controllable by the plant management, as they will be able to choose whether to sell the raw biogas, or process it further into the product commanding a higher price. What the biogas plant opertor can get in payment per cubic metre for the raw gas can only be assessed by finding a local buyer and negotiating a price. The mount of biogas any particular biowaste will produce varies greatly depending upon the technology used, however, it is most common for gas production rates to be in the range of 70 to 120 cubic metres per tonne. Furthermore, biogas contains something like 55 percent methane. It is solely the methane present that contributes to the energy value. 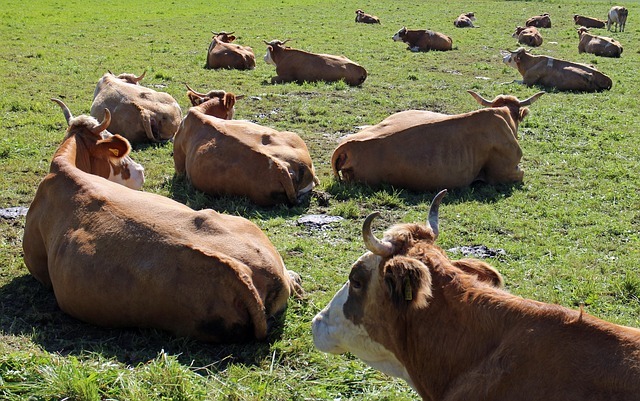 At 55 per cent methane content the energy content of the raw biogas is approximately 21 MJ/m3. Before that can be calculated as a net output of biogas energy that can be sold, it is necessary to deduct the sacrificial loads which will be used to run the biogas plant itself. As a rule of thumb between 20% and 1/3rd of the energy the plant generates will be required to power the process itself. For example, if a plant was to process 20,000 tonnes per annum of biowaste, it would be able to export to something like 400 kW of electricity and in addition 750 kW of heat created in producing the electricity. The feasibility of using the heat produced by the gas engine when generating the electrical power varies greatly. Often, there is no readily available user for the heat, in which case a standard air-cooling radiator system is normally installed. However, with suitable investment a CHP system in which hot water is piped, for example, into a number of small businesses to provide heating nearby, the waste heat can be sold very profitably. Of course, by adding CHP the overall carbon footprint of the AD plant rises further, and this can be an advantage for the owning company if it wishes to show off its “green” credentials. Alternatively it has been suggested that the gas might be processed to produce diesel fuel, in which case it would provide 1.4 million litres of diesel fuel each year. If the compost was also to be sold it would provide an income. The quantity of compost produced again varies greatly, but a rule of thumb used here would be to assume that 40 to 70 percent of the feedstock input will become compost (fibre). After further aerobic windrowing of the compost from #anaerobic digestion, and (screening) sieving, can be solved into any local market which exists for selling aerobic compost. therefore, assessing the local market for anaerobic compost will provide a guide as to the saleability and value of the fibrous output from a biogas digester. Contaminants and unwanted materials are removed from the feedstock at the start and during screening of final compost. These are usually called “rejects”, and as the disposal will cost the biogas plant operator it is necessary to quantify the amount of this material, which will probably have to be sent to a landfill. It is hard to generalise the proportion of the compost which will arise as reject material. All that can be said that the reject material typically comprises between 1 and 10 percent by weight of the total compost produced. The quantity of liquid digestate, not including additional liquid added if needed to improve pump-ability, and not including any additional liquid added to avoid excessive nitrogen/ammonia present within the digester, will be as a “rule of thumb”, between 10 and 30 percent by mass, of the input waste feedstock tonnage. The liquid digestate created by the digestion of waste materials which include MSW food, is by default deemed not suitable for use as a fertiliser of any crops in te UK. As a consequence, while this remains the situation in the UK it is almost impossible to sell it. However, it is known that the UK government department Defra, appreciates that this is a problem and is endeavouring to change the regulations about this. Until alternative methods of using the liquor from MSW, such as to fertlize hydroponic systems, use it in aquaculture, or simply concentrate it and further purified it as fertilizer-crystals, it will need to be further treated before being discharged to the sewer. A formal discharge consent is of course needed in order to do that. We nearly called this article “why flatulence (#biogas) is better than wind”, but we decided that it was a little bit too flippant for such a serious subject. There are in fact that least five reasons why #anaerobic digestion as an energy source, is better than #wind energy. We know that statement might surprise our readers, and if that is you to read on, and we hope you will think differently by the end of this article. 1. The most important fact that outstrips all others, and we make no apology for placing first in in our list, is that AD Plants generate electricity 24 hours every day. A reliable and well run anaerobic digestion plant will provide a base load of electrical power 24/7 and 365 days a year, every year. Until technology finds a low-cost and reliable way to store electricity, or to store energy which is ready on-tap for use on-demand, when people want to use it, it will remain necessary to maintain fossil fuel generating capacity alongside all the wind farm capacity. The true cost of wind energy should therefore be calculated on the basis of the cost of the wind energy itself, plus the cost of maintaining a fossil-fuel powered power station capable of delivering the energy of the wind farm, and to do that while being on-call at a moment’s notice, ready for when the wind stops. Although, the reserve backup capacity may not need to be 100% of the wind farm generating capacity, if the power grid extends over an extremely large geographical area. The above reserve capacity then provided, can only be less than 100%, if it can be shown that there will be no occasions when all wind farms in the grid feed area, would never all be becalmed simultaneously. Winter farm subsidies, are not based on this presumption and therefore are subsidized at an unrealistically high level by governments. By contrast, anaerobic digestion power, due to its continuous baseline supply capability, holds none of these hidden costs. Which also include, the use in the case of wind energy, unsustainable energy in the form of carbonaceous fuel consumption. 2. Anaerobic digestion is better than wind farms, because most anaerobic digestion consumes waste, this waste would have harmful consequences if it was not digested. Clearly some wastes are more hazardous to the environment than others. The biggest advantage to the environment when a waste is digested comes from digesting food waste. Food waste increases the risk that the environment will be damaged by polluting emissions if it is placed in landfills. However, all of organic waste is less hazardous to the environment once it has been digested. Not only that, anaerobic digestion contains a pasteurization stage during which it is sanitised and any pathogens present, and seeds, will be killed. 3. A wind farm, once it has been constructed and commissioned, provides very little in the way of jobs for local people. By contrast, an anaerobic digestion plant will require at least one, possibly more, plant operators for as long as it is in use. 4. The turbine blades at wind farms provide a hazard to birdlife. An anaerobic digestion plant does not provide any hazard to birdlife. 5. The motion of wind turbine blades produces noise which can be heard over very long distances. An anaerobic digestion plant, may produce some noise which is potentially audible to those within about 50 metres of an AD plant. Noise nuisance from AD plants is orders of magnitude less intense. Anaerobic digesters, can be described as able to kill three birds with one stone, because they produce renewable energy, treat waste, and provide a valuable agricultural fertilizer. It would be a little bit unkind, to say that winter turbines only in comparison, kill three birds with one blade! However, the reader will by now have picked up the views of the author in respect of wind energy… All the author would ask of governments which promote wind energy, that they set tariffs and other incentives at a level which reflects the fact that wind energy is not such a good (nor economic) provider of energy as it might appear to be at first sight. To give incentives to wind energy which are comparable to, or greater than, anaerobic digestion facilities is illogical. So, we return to where we started this article and repeat that; “flatulence, not wind, is the way to go”.